First off, this is the most time-consuming vector of my entire vector career. 29 hrs, beating my previous 22. I didn't expect it to take quite so long (I estimated 20 hrs), but I guess it's because I spend so much time on every detail. Even though in the end, you can't really tell. (Abul-kun said he could do it in 6 hrs; he's probably right x_x).I hate frills >_< There's all kind of lighting effects here, on their hair, the sword, even their clothes, but you can't see it much. 3 hours was spent on colouring the staff alone, because I tried some of that multi-layered vectoring that gives it a painty-look. My first time doing that, you can tell me how it went. Now the wall. I tried some more painting. I know I'm not that good, but I'll improve, right? I painted the snow and mountains myself (I like the mountains on the right), and the clouds were part of another scan that I painted over. Oh, and the tree was from a Kanon scan but I also painted over it. I do realize that the wall seems kind of empty; however I realized the more I add to walls, the worse they get. So a nice simple wall will do, I guess. (b) You might think Sakura would be cold in this outfit. But I believe if she can rollerblade in the winter in her short-skirted seifuku, then she'll be just fine. (c) It seems now that I adjust my monitor settings, you can't see the painted snow as much. I may update that later. Woow! Is so sweet! 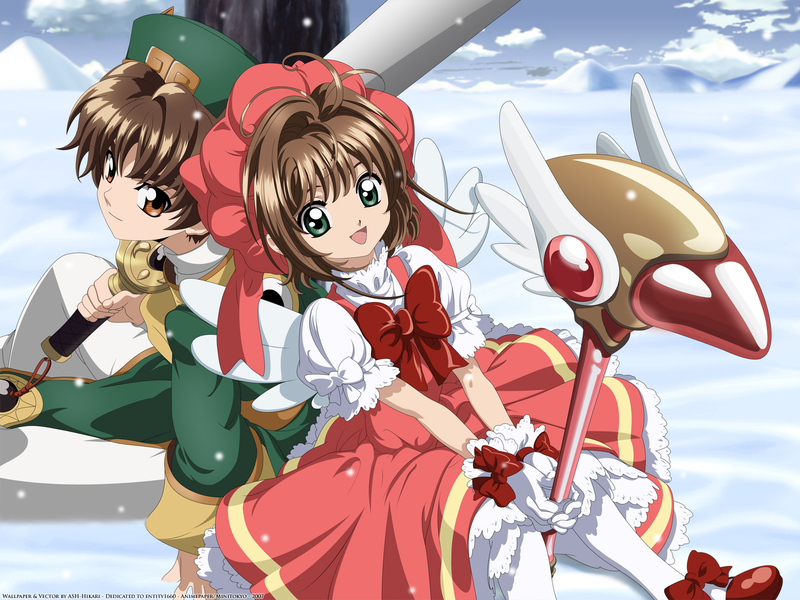 I love Sakura and Syaoran! The vector is so beautiful! I love it! Beautiful wall, fantastic vector, and stunning imagination. Love it! im busy now so ill commennt later, ok? Ahh, your lucky I love your works. Another excellent vector wallie from Ash-san! It has beautiful lines and the color is great. I love the staff, neat and shiny. This should be faved by everyone! Whoah, I simply love how you've used multi-layered style on the wand. It looks gorgeous! Background is absolutely cool, snowy, fresh and it's fun! Flawless vectoring again, Ash. Simple at first glance, but high in details when fullview. Great work! ps. One thing though, the tree might look better if it isn't blurry. Textured version looks nice, but I prefer textureless one cause it's softer yet so pure. I can't resist to fav this. Very smooth textures and it's got that 'happy' atmosphere. Feel like Christmas is round the corner. Another well done job Hikari-chan. Anyway, nice vector, very clean as always ^__^ I like the detail on the wand. The tree, while it's well-made, looks a bit random and.. unnecessary, and it blocks off the openness of the perspective of the background, if you know what I mean ^^; Also, because the background is so light, the black outlines stand out a bit too much from it... maybe use a brown outlines instead of pure black to soften it a bit? Nice job painting the background, esp the snow ^^ And the clouds look nice too, though they're a teeny bit over-smudged, but that's okay.